Sometimes, a plastic Nut is ideal for a light-duty Trapezoidal Lead Screw mechanism. In applications where lubrication is not an option or near-silent operation is important, self-lubricating plastic nuts are an ideal solution. The option to use plastic components is often very dependent on the working environment in which they are being used, as unsuitable conditions can cause damage to plastics. For this reason, if you are unsure of your decision, we recommend a consultation with AccuLeadScrews’ technical engineering team. Plastic materials often possess a number of desirable characteristics, such as self-lubrication and low friction, but are also inhibited by operating temperatures, water absorbency issues, or mechanical and structural traits which may be unsuitable for the desired application. A close analysis of the application and the conditions it will be exposed to is required in order to obtain accurate analytical results. In regards to the use of plastic nuts, the study of the p●Vst allows us to create a graph which describes the way in which sliding speed and surface pressure interact when using plastics. This graph will illustrates a region in which Lead Screws and Nuts operate with enhanced efficiency and limited wearing to the Nut. 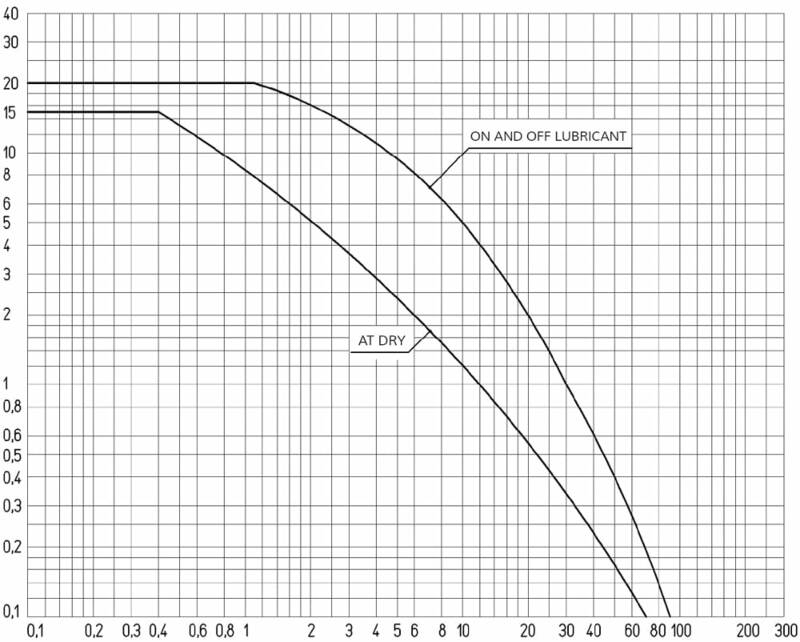 Operating outside the area illustrated on the graph is highly discouraged, as this will cause rapid erosion of the nut as a result of the high levels of friction. Graph No. 2 shows p●Vst of a nylon cylindrical nut. Due to the fact that this plastic is wear-resistant, but not self-lubricating, two arcs have been drawn to represent operation when dry, and operation when well lubricated. Safety Factor for the Forces of Inertia "f i"
The sizing process also requires an analysis of the inertia forces present during acceleration and deceleration. If the value of p●Vst remains within the controlled limits, inertia values are relatively low, and are of an acceptable level. In the presence of varied, irregular motion, the safety factors reported in Chart No.2 must be considered.